Since search quality indicators have become an increasingly important factor for search engines, evaluating SEO content performance in search engines using Google Analytics is becoming equally important. Content analysis is made more complex with the loss of data from users logged into their Google accounts and, eventually, users from the Chrome browser as well. This article is for individuals who are starting content analysis using Google Analytics. It describes a simple top down method for content insights. The traffic sources level view is the view of Google Analytics when only have one segment applied for a single medium or a medium and source. The traffic source level view is useful for getting a bird’s eye view of organic search engine traffic. This view is useful for mapping overall search performance, identifying any unusual drop-offs, and reading annotations. Traffic source level data is useful for looking at broad trends, such as comparing year-over-year performance. However, this data ought to be taken with a grain of salt, since you run the risk of increases in traffic in one section of your site masking drops in other sections, when the data is viewed in aggregate at the traffic sources level. Generally, after you have a bird’s eye view, it’s useful to conduct deeper drill-downs into this data by source – such as Google or Bing – in addition to medium, which is organic search for organic content research. The landing pages report is by far one of the most insightful reports for SEO content research. It can be found in the side navigation under standard reporting in content > site content > Landing Pages. The beauty of the landing page report is that it tells you where organic visitors are landing on your website. 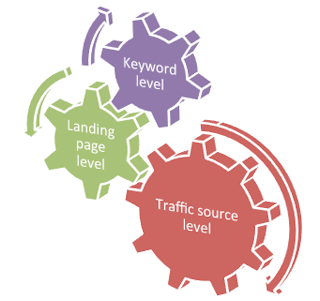 I usually evaluate the landing pages report by segmenting it by source, such as Google or Bing. Usually at this point, it is useful to break out the content into different sections of your website. One way this can be done for an ecommerce site with a number of categories is to break out each category separately, as well as article and blog sections of your website. For a lead generation based site, it may be useful to break out pages in your top navigation, your blog and location based pages, if you have them. To break out different sections of your website, you can use the in-report segmentation, which segments data for a given report. This is different from the sitewide segmentation because it isn’t applied across reports. When you have your landing pages report open, simply enter the folder name of the given section of your site and click the looking glass icon. Once you click the icon, you will only see landing page data for your selected section of your website. The graph at the top also becomes useful in that you are now able to view a chart for performance for only a given section of a website. Although it takes a little bit of time to view this data for all sections of a given website, it is useful for viewing relative performance of site sections across a number of metrics. One trend that is useful for specifically SEO purposes is finding sections of a website that have very low traffic and that also don’t convert well. For these “lower quality” sections of your website, do a site: command and record the number of pages indexed. Now you can evaluate the pages more closely and decide if either content that should be to be better optimizing or if the low performing ought to be reduced or otherwise removed. Viewing landing pages report by site sections has also been widely used for identifying sections of a site that are more or less greatly hit by a Panda Update. Keyword level research has become more difficult, due to Google’s decision to remove some organic referrer data. Generally speaking, viewing just a keyword report isn’t the most useful for analyzing keyword level data. A better way to go: view keyword data from the landing pages report. The benefit of viewing the data using the landing pages report is that keywords are grouped by landing page and instances of (Not Provided) are also grouped by landing page. Exporting this data can be used for further research into what ranking position is for a given keyword. This data can also be combined with Google Webmaster Tools data as well as well as other third party tools. For content research purposes specifically, keyword level data can identify longer tail keywords for which you are bringing in good quality traffic. You can make this information actionable by using it to identify which of these keywords need better on-page optimization. As you view keyword data along with landing pages data, make sure to have the landing page open, so you can easily see where the deficiencies are. Also, try think about changes to be make on your site in terms of sections, so ask yourself during your research: How can we improve our category page? Avoid thinking in terms of single pages or single keywords, unless you see something really earth shattering. This will help you avoid missing the forest for the trees. Internal site search tracking is useful for content analysis. If you don’t have this set up in your Google Analytics, do it today. In cases where internal site search is a secondary action on your website, it can be used to find new content or keyword opportunities that you may be missing. Here is an article exploring the benefits and uses of internal site search further detail. Although the focus of my article is mainly content performance for an SEO standpoint, not even mentioning engagement would be an oversight. Here is a good article by Avinash Kaushik for getting on the right track in terms of thinking about user engagement. “Maximizing Google Analytics Insights for SEO with Custom Reports“: This is a cool article for those new to custom reports who want to explore the many different ways you can measure. “Measuring SEO Success via Google Analytics“: This is a great article covering some key basics of analyzing SEO using Google Analytics. Chartelligence: Although this plugin is a little beyond the scope of cut and dry content analysis, it’s very cool because it allows you to overlay Panda updates over your Google Analytics. This is useful for when you’re doing content analytics for Panda purposes to see if traffic changes in analytics coincide with Google’s updates.